Coral Triangle Adventures’ second trip to Belize and the Caribbean Sea was another one to remember. Once again our group of snorkelers was stationed at the tranquil and remote Turneffe Island Resort, situated at the southernmost end of Turneffe Atoll, about 20 miles due east of Belize City. Though the trip began with a bit of windy weather, our locale on the Mesoamerican barrier reef quickly reverted to blue skies and calm seas. Throughout our time at Turneffe we were able to explore a number of different marine habitats during our snorkels including shallow, inner lagoon reefs, outer reef slopes with dramatic spur and groove channels, the world famous Blue Hole, as well as some mangrove and seagrass environments. Turneffe Atoll is fringed by an endless maze of lush, low mangrove forests with idyllic, sandy islands found on the windward edge. From our base at Turneffe Island Resort, most of our snorkeling sites, where we spent hours in the water, were only a few minutes away. This year we noticed a large number of elasmobranchs that were found on almost every snorkel. Large Southern stingrays, Roughtail stingrays, well-camouflaged Yellow stingrays, majestic Spotted eagle rays, sleepy Nurse sharks, and even a good-sized Lemon shark were seen. The stingrays were especially prevalent and everyone in our group was able to closely witness feeding behaviors of the Southern and Roughtail stingrays. Our snorkel around the shallow edge of Blue Hole, located in the middle of the remote Lighthouse Reef, was as good as snorkeling gets in the Caribbean. The famed World Heritage Site is a perfectly round marine sink hole, fringed by vibrant sea fans, sea rods, sponges, and hard corals that grow just under the water line. Parrotfish, angelfish, barracuda, grunts, and countless other species meander along this colorful reef, making it a perfect snorkel site. We then had a picnic lunch on the idyllic National Monument of Half Moon Caye where Red-footed boobies and Magnificent frigatebirds nest in huge numbers. 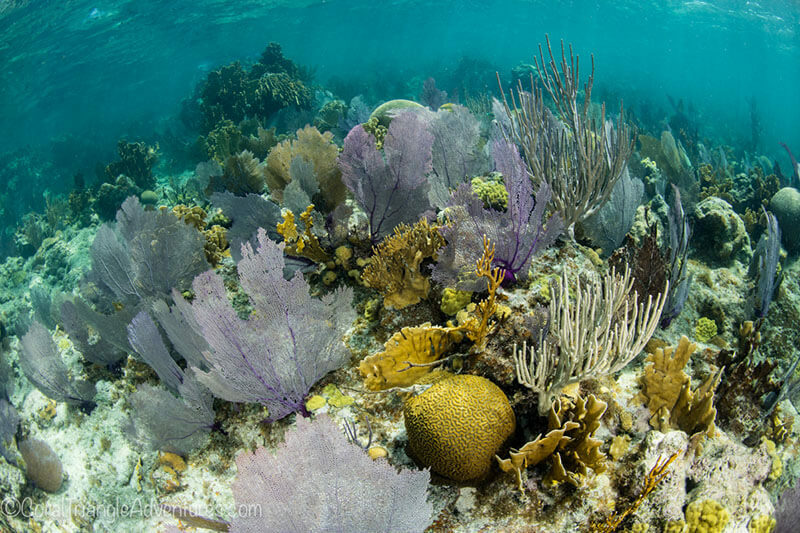 This entire area is part of the Belize Barrier Reef Reserve System and is well worth the time to explore underwater. Another of our many highlights was having a few minutes of snorkeling with several playful Bottlenose dolphins in the midst of the lagoon. It looked as if we were in the presence of potential mating behavior as they were being quite rambunctious. Whatever behavioral event was happening it was fun to be there and witness it! Overall, we had a fantastic group of enthusiastic snorkelers and a beautiful experience snorkeling the shallow coral reefs, seagrass meadows, mangroves, and drop offs. We are certainly looking forward to future explorations of the Caribbean Sea.